notes promotional set released by the publishing company. 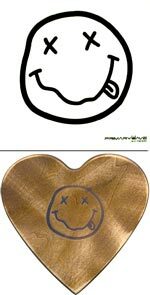 more information on pennyroyal 3.
cardboard outer box: printed with the smiley logo and the company logo, many sets miss it. wooden box: 19x20x8 cm. the lid is etched with the smiley logo on the outside and with the company info on the inside. the company logo is etched on one side and the number of the box (out of 500) is etched on the bottom side. on the inside the box is lined at the bottom with a piece of "grunge" flannel. a spindle holds the cds and insert, which are kept in place by a rubber ring. cds: five cds, separated by clear plastic spacers. the first three (disc 1, disc 2, disc 3) contain a selection of tracks from nirvana's albums, the fourth (disc 4) contains cover versions of nirvana's songs made by other artists and the fifth (disc 5) contains lullaby and string renditions. musical box: attached on the inside with a piece of velcro, it has a light sensor on the top and each time the lid is opened it plays 40 seconds of "heart shaped box", carillon-style. fortunately it can be silenced applying a piece of black tape on the sensor.